You know your HR department as the people who hired you, the people who give you gobs of paperwork to fill out, and the people who might fire you if you become a slacker or the business needs a change. As such, many people feel like avoiding HR is the best path to success—stay off their radar and all will be good. But, did you know that there's a lot of career help available in your HR department? HR staff may not specialize in your job, but they are specialists in helping with careers, and they are there to help. Here are ten reasons why you might want to stop by your HR manager's office today. Career Planning: You may have heard that HR is focused on helping the business succeed, and not on career help for individual employees. This is true. But, the business won't succeed if there aren't good employees, and good employees want to move forward in their careers. Your HR manager can often help you map out the path to your ultimate goal. 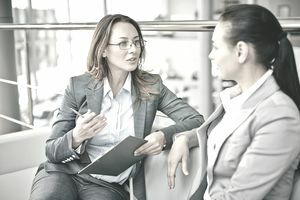 If you want to be the CFO, she can help you identify areas where you are weak and areas where you are strong, and help direct you down career paths. Bonus—when the senior leadership team says, “we need someone to do X,” if you've told her that's something you're interested in, your name is more likely to come up. Managing Your Manager: Not every manager is awesome. And not every awesome manager is awesome for every employee. Whether you've got a manager you just don't click with or a micro-managing jerk, your HR department can help. Continuing Education: Does your company offer tuition reimbursement? If you don't know the answer to that question, head to HR and ask. Lots of companies offer this perk—especially if the degree or certification you're seeking is something to help the company directly. If you're an accountant, asking the company to pay for your master's degree in Art History probably won't fly except at companies that provide assistance for any college coursework. But, if you want to ask for tuition assistance for review classes for your CPA, there's a good chance there's money available. If you're not in need of a new degree, but want to improve skills, ask about certification classes or even MOOCs that can help you fill your knowledge gaps. Changing a Performance Rating: Was your last performance appraisal accurate? Now, most of the time, HR is going to side with your manager—your manager sees your day to day work and HR oversees numerous employees. But, if you feel there was a genuine mistake in your rating, talk to HR. Your HR manager will look over your review and compare it with your peers' and your prior reviews. If she feels there is a case, she'll talk with your manager. Pro Tip: Come with solid evidence of your performance, not just a complaint that the review is not fair. Resume Help: This may seem counter-intuitive: Your HR department doesn't want you to leave and leaving is the only reason why you might need your resume up to date, right? Wrong. If you're applying for membership in a professional society, looking at an internal promotion, or want to be accepted to graduate school your resume is a helpful tool. Additionally, if you are laid off, sometimes your former HR department will provide help with your resume. Ask! The worst they will say is no. But, if you're struggling in your marriage or drowning in a sea of debt, she can help direct you towards an Employee Assistance Program (EAP). If your ex-boyfriend is stalking you, she can help notify security and reception to keep an eye out for him and to help make a plan to keep you safe. Pro Tip: The EAP number is probably on the company website, but feel free to ask HR. Medical Problems: Do you or a family member have health problems? Are you or your spouse pregnant? Head to HR. If you start missing work because of migraines but don't say anything, you could get fired for violating attendance policies, but if you come to HR, you can fill out the paperwork for legal protection. Your problem might fall under the Americans With Disabilities Act or the Family Medical Leave Act. With both, you need to ask for help. Don't assume your manager will automatically know the reason for your absences qualifies you for protection. Remember, these laws often protect your family members as well—if you need time to take care of a seriously ill family member. Whistle Blowing of Any Kind: Some big companies have anonymous tip lines for any violations you may see; others have a designated person with whom you can talk. But you can always walk in and talk to Human Resources about this as well. You can report anything from safety violations to securities violations to your HR department. They'll set an investigation in motion. Managing Your Employees: If you manage employees, your career success depends on their career success. If you want help knowing how to manage without being overbearing, how to discipline fairly, and how to get the best results from your team, ask your HR manager. Your HR manager may provide coaching to managers directly, or she may refer you to a management class or consultant. Take the referral. The class or consulting are worth your time. Help You Navigate the Law: You don't want to confuse HR managers with employment law attorneys, but they should have a good grasp on basic employment law. If a co-worker complains that her boss is acting creepy, you can go to HR for advice and report sexual harassment. If you have an employee threatens to sue you, report it immediately—even if you're sure he's just blowing off steam. Don't let legal problems build. HR has the resources to help guide you, and they know when to call in the big guns—the attorneys. While HR will always have paperwork for you to fill out, don't forget that they are there to help the company succeed. That means that HR knows that the individual employees also need to succeed. Have a chat and see if they can help you help your career soar.